Tailored to talented students majoring in other disciplines, UO’s Minor in Ethics is designed to enhance the capacities of critical thinking, social engagement, and reflection on major moral issues that are the hallmarks of ethical inquiry. Offered through the Philosophy Department, this Minor will prepare students with a full suite of tools for critical reflection that will help them to address the major moral challenges of the 21st century that they are bound to meet with in careers in business, science, journalism, advocacy, nonprofit work, law, and all aspects of health care. 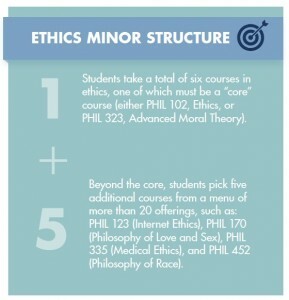 The Ethics Minor has a straightforward structure that is meant to easily fit into students’ busy courses of study in their elected major. Students take one core course in ethics plus five additional ethics-related electives. It’s that simple. The core course requirement is designed to give students a foundation in ethical inquiry and moral reasoning—it can be fulfilled with either PHIL 102 ‘Introduction to Ethics’ or PHIL 323 ‘Advanced Moral Theory’ (both courses are offered at least once per year, and typically more frequently). The five ethics electives can be chosen from a menu of more than twenty standard course offerings with even more options every term amongst rotating topics courses (meaning there will always be multiple ethics-related electives every term). Click on the link above to explore the full list of course offerings. 1. Required Credits: 24 credit-hours (6 courses), including at least 12 credit-hours (3 courses) in upper-level (300- or 400-level) courses, of which at least 4 credit-hours (1 course) must be in a 400-level course. No more than 8 of the total 24 credit-hours may be taken as pass/no pass. 2. Minimum Grade Requirement: C- or better in all courses used to satisfy the minor. 3. 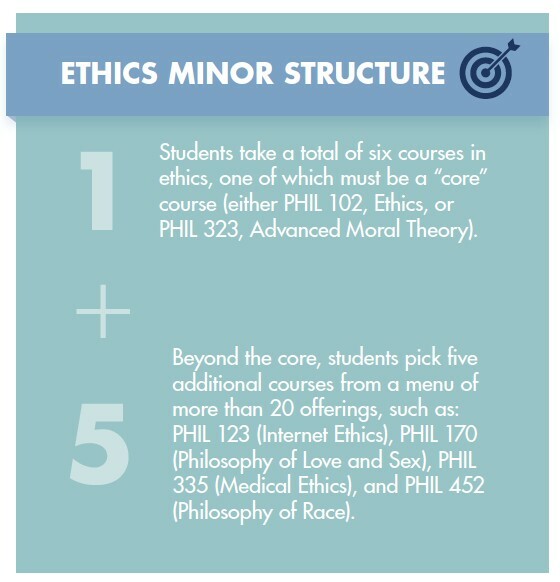 Course Distribution: first, a ‘core ethics requirement course’ taken as either PHIL 102 or PHIL 323 (with a waiver option for this requirement if students with transfer credits from another institution can supply a syllabus indicating evidence of a similar course of study); and second, just 5 more ‘ethics electives’ courses from the approved ethics minor course list. 4. Residence Requirement: at least half of the required 24 credit-hours must be taken in residence. More details can be found in the ‘Got Ethics? : An Introduction to UO’s Ethics Minor’ informational slides. You can also email the UO Ethics Minor Director at ethicsminor@uoregon.edu. To declare a Minor in Ethics just click the link above which will send you to a page where you can declare your Minor in Ethics. Please note that a student majoring in Philosophy cannot also minor in Ethics; however, a student can minor in both Philosophy and Ethics.